Got a letter from Dolly Parton Today! Thank you Dolly! I Love you! I also gave Dolly a gift in December 2014, a CD with the artist Amanda Jenssen : Happyland . From the message from Dolly, I know she loved the gift very much. To my readers: I don’t publish Private messages. In this case it’s a message to one Of Sweden’s well- known artist. I hope she get Happy as much as Dolly is for her Music . During the weekend I got alot Of questions at my Social Media, Twitter: @Dollyfancom and at Facebook from Y’all Dolly Fans. So I decided it’s better that I answer all your questions here. 1. What adress did you sent your letter to Dolly? 2. How long did it take to get an answer? Y’all know that Dolly is a busy artist and a business Woman. So be patience. 3. What did you write to Dolly? I’m sorry, I can’t tell, It’s between me and Dolly, loyalty is important to me. I hope this will help Y’all. 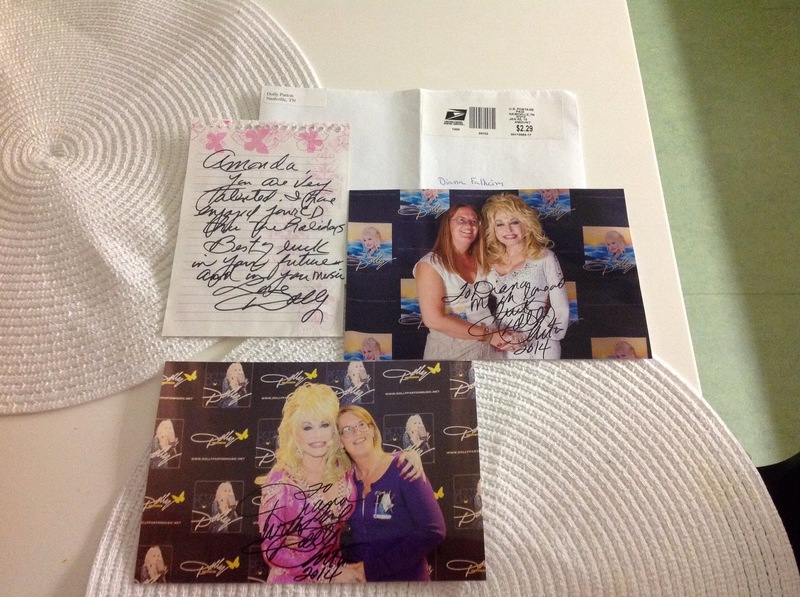 This entry was posted in News, Special Guest, Uncategorized and tagged Amanda Jenssen, Autograph, Beautiful, Diana Falheim, Dolly Parton, Happyland, Letter, Lovely, Photograph, Photos, Sweet by dollyfan. Bookmark the permalink. My name is Matthew Lyon and my wife Tara is a huge fan. She has grown up listening to you all of her life. She in her 28 years of life has been through so much loss. She has lost all of her grandparents, her sister, her father, and her mother committed suicide while she was pregnant with our first child. Though she has been through all of this she still continues to hold onto her faith and remains a great mother and wife. Her biggest dream is to meet and or hear from you some how. My prayer is for a miracle that somehow she could hear from you. I know that would truly make someone so deserving as she truly happy. You are lucky even if you miss a ticket, you can hung out outside the venue and still listen to her golden numbers. When is she ever going to perform in Africa? I can bet she will have to perform in a stadium!! Nairobi would be quite ideal Ask me. Can anyone help me out? Trying to find tickets to Dolly. Airway Heights, Northern Quest Casino, Spokane Washington, 9\22. I don’t know where to look? Venue sold out, only scalpers? Suggestions please contact me! 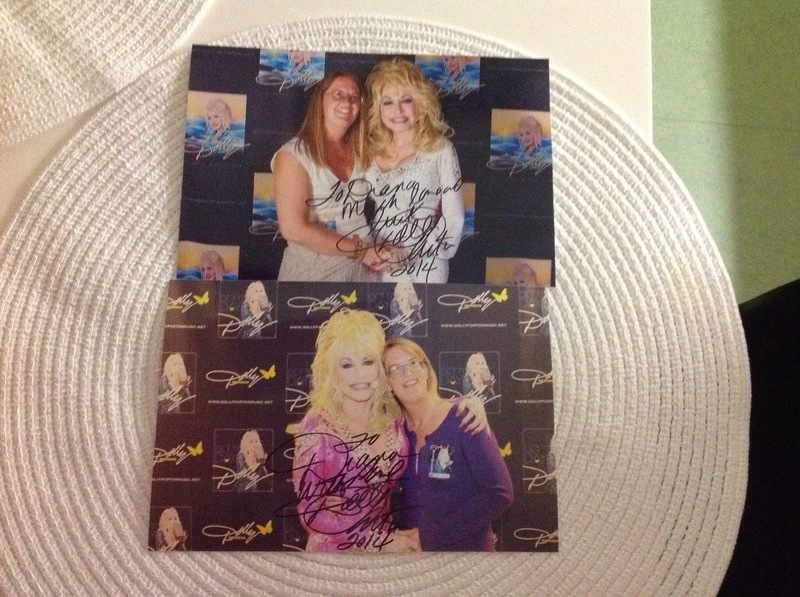 Dear dolly, my name is ashley, I’m a big fan of yours, i love your song’s, and i also love your movies, my favorite movie is steel magnolias that was the best movie ever, it made me laugh and cry,you are my idle and my favorite country singer. Hi. Dolly is coming to Greenville sc for a concert in a few weeks My daughter is related to her very distantly. Sam Valentine and Dolly’s grandfather were brothers and Sam is also my daughters great great grandfather. I’m planning to take my daughter Dreama to see dolly at the concert but wanted to email dolly or the agent that covers her. But all the email addresses I try are invalid. I even tried http://www.dollyparton.com. Any suggestions? HELP! Write to her fan mail adress. Hello my name is Chuck Fisher I live in severvill and have and idea for a restaurant in piegon forge. U have the resources that I don’t .steak and salad. Are interested ? You can con tact me at 609_410_5623. Thank you for your time. hai Dolly wanneer kom je naar Holland ??????? My name is Joseph Jones from Mississippi and everyone calls me JJ. I wanted to ask you a favor and I really need it. I’ve had a rough life growing up but I had a mom who always took care of me when I needed it and she done without for me and to make sure I had everything that I needed maybe not what I want but what was needed .. I watch that lady struggle and work hard to put clothes on my back and food in my mouth. My dad left my mom when I was about three years old so my mom is a HUGE part of my life and she’s been my life. If I could at least Get a chance to let my mom and my family or at least her to meet you one time I would be so greatful. I think that lady deserves it because she has nearly worked her life off on me and my little sister and brother… We never really had the money to take a vacation to actually see you… My mom is a huge fan but so am I? So please Mrs. Dolly if you reconsider please contact me back by email or phone. Love Dolly all my life saw dolly at 02 so glad I got tickets little sparrow was mindblowing you could here a pin drop . Unfortunately my husband passed away soon after but we always wanted to get to see dolly.i feel blessed as my husband and I have all her music and means so much to me.im a spiritual person and believe those tickets were sent to us as he passed soon after. I know she must be so busy.but I follow her life.im registered disabled now so wont be able to give get to dollwood.but at least we saw dolly and we were so happy.god bless to dolly parton a true insperational person.we were sent a angel when dolly was born. Oh Dolly, when are you ever going to come to Africa? I have written her many times, no response. I live in Sevierville just down from her old home place. Im very dissapointed. I would like a response. hi dolly my birthday January 19 is the same as your so happy birthday early dolly.